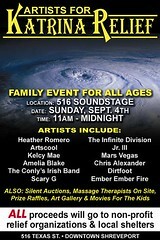 Tipitna's Music Office Co-Op/Shreveport and 516 soundstage present the "Hurricane Party!" A week full of events to benefit the hurricane victims. Each day features a separate event with proceeds and donations, etc. to assist the displaced hurricane victims. 516 soundstage opens its doors as an air conditioned shelter for displaced musicians and their families. A secure storage facility for music equipment is provided, as well as a drop off point for canned goods, clothing, toys, and toiletries to be distributed through the Red Cross and Christian Service. Displaced Musicians may play for tips. Open acoustic jam with Kurt Copeland and the Congregation. Displaced Musicians may play for tips. Hosted by Heather Romero. Displaced Musicians may play for tips. The shows must go on. Featuring American Tragedy. 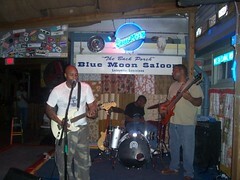 SUNDAY, September 4th, 11AM-MIDNIGHT: HURRICANE JAM! Bring canned goods, clothing & toiletry donations, etc. as admission. Line up includes: Dirtfoot, Mars Vegas, Infinite Division, Redshift, DJ Jalapeno, Artscool, DJ Quickie Mart, Amelia Blake, Heather Romero, and many others. or Tom E. Gun (318) 226-0901. Carter Sutton writes "Daniel Keele created the poster. In the past 36 hours, I have been amazed at the generosity people have displayed in helping with show." Ballet Under the Stars, presented by the Shreveport Metropolitan Ballet (SMB), will be held Saturday, September 10, in downtown Shreveport’s Festival Plaza, at 7 p.m. Admission is free, says SMB's Susan Gross. Balletists will share the stage with jazzers and modern dance movers as SMB gives way to performances by Louisiana Dance Theatre, Power & Grace, and Cyndi’s Dancers of Homer, Louisiana. During intermission, children in the audience will be invited to perform onstage. More info: Shreveport Metropolitan Ballet office at 459-1457. This outdoor event is electric with springy energy and has proven itself worthy of highest recommendations. "The Noble Savage is our favorite venue," writes Don Echols, bassist for Gypsy Mountain. "We're playing there Sat, Aug 27." The Gypsy Mountain brotherhood, as singer Will Maranto likes to put it, is all about good time rock and roll. 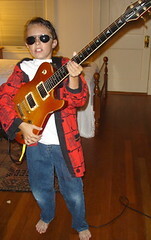 Their influences are ecelectic, ranging from early rock to Eagles and Steve Miller. The Gypsy Mountain CD is a solid piece of work, as are the dishes on the menu at Noble Savage. Among my favorites at the Noble Savage are the gourmet pizzas. Some of the beers are so thick they are a virtual meal-in-a-bottle. "The coffee got us in - but the food is what I really want to do. Food is my love. And music goes hand in hand with it," says Lee Bamburg of his sleekly re-decorated Java Junction. On the corner of King's and Alexander St. and across from Centenary College, the spot is aiming itself toward the college and med school crowd. The wi-fi connection is complimentary and the coffee is Lavazza, which Bamburg says is the most popular coffee in Italy. A graduate of BPCC's culinary program - "I studied under Chef Liz Dixon" - Bamburg apprenticed in his dad's - Michael Bamburg - restaurants in Bossier and Minden. The music is being performed early - 7 to 10 pm - and it's an all-ages shop. Performing acoustically Fri, Aug 26, is Keith Horton ($5). Bamburg's favorite sandwich: grilled chicken with balsamic vinegar and olive oil on a bun; it's called the Chicken Alexander for the street next door. See her paintings - in layered egg tempera - at Meadows Museum of Art, Centenary College. Thursday, Sept. 8, Public convocation on campus with Barbara Earl Thomas, 11 a.m., Hurley School of Music, Anderson Auditorium. Ms. Thomas will speak on the topic "sense of place"—how one's identity and understanding of the world is shaped by his or her family of origin and the community(ies)to which he or she is connected by birth, choice and other circumstances. Meadows Museum of Art: 2911 Centenary Boulevard. Open Tuesday, Wednesday, and Friday from noon–4 pm. ; Thursday from noon-5 p.m.; Saturday and Sunday from 1-4 p.m. Admission free. For more information: 318-869-5040. Louisiana Public Broadcasting will air the winning entries from the 2004 Louisiana Film Festival-Student Division on Sunday, August 28th at 2:30 P.M., says Chris Jay. In the Shreveport-Bossier region, the films will air on KLTS-TV24. KLTS runs on Cox Cable Channel 13 in Bossier City and Channel 11 on Time-Warner Cable in Shreveport. Former Captain Shreve student Chris Lyon and former Caddo Magnet student Luke Lee were the Grand Prize winners for their modern day adaptation of the Julius Caesar story entitled “Et Tu”. Both were seniors when they produced the film. Caddo Magnet students Danny Lachman, Evan Falbaum and Hunter Carter won the LPB Award for their films “Hey, God”, “Sweat Slayer” and “Daddy”. 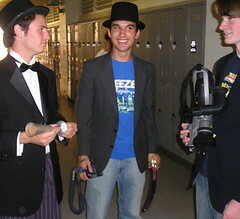 The Louisiana Film Festival-Student Division, a co-presentation of The Robinson Film Center and Centenary College, will return March 31st-April 1st, 2006. Students and educators interested in submitting original films produced by K-12 students may contact Dr. Michelle Glaros at (318) 869-5264 or e-mail mglaros@centenary.edu. The Robinson Film Center is a Shreveport-based not-for-profit organization committed to establishing a venue for the best in classic, independent and foreign cinema while serving as a regional resource for filmmakers and educators. "I was surprised at the guitarsmanship of Johnny Rivers - apparently he did all of the lead work on his early recordings. And his vocals are still very strong. 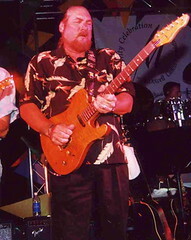 But the real sleeper was Steve Cropper. I've heard him interviewed, and he said he wasn't much of a lead player, but that he had a talent for finding and setting the groove and pocket. However, his performance proved that wrong. He's a competent lead, with minimal notes but soulful, "big note" playing. He performed both lead and vocals on "Midnight Hour" and "Sittin' n the Dock of the Bay." Very competent vocalist, AND, he nailed all the fills and accompaniment from the recordings. He even did a very full guitar version of the horn break on Midnight Hour. The jam with "Green Onions" was the highlight of the evening. Great Hammond organ, Dr. John on piano, plus Steve Wariner, Jeff Baxter and Burton. Cropper has a big, southern boy heart, and it showed. He mentioned his fondness for the city of Shreveport and his wedding here 17 years ago. He's still married. Acoustic soloist Doyle Sykes was the most gifted player, and Steve Wariner did an excellent acoustic set as well. There was the expected fast playing by Eric Johnson and Brad Paisley, but their rapid fire licks were dulled in the closing jam by too much overall band and bass volume. Ever heard of Greg Koch or Roscoe Beck? Very good, very solid. Excellent lady drummer. Attendance? 2/3 to 3/4 capacity. Most of the crowd seemed like Elvis fans." Huckabay founded and produces award-winning work at Focus Communications, Inc., 219-7688. Though it contained films created by the scuttling of crustaceans and the smearing of human blood, the 5th Annual International Experimental Cinema Exposition (somehow represented by the acronym T.I.E. ), on Saturday, August 20th, was one of the most accessible and fast-paced Minicine? events in recent memory. Housed in the upstairs gallery of ArtSpace, the event lacked the decidedly basement aesthetic of most Minicine? 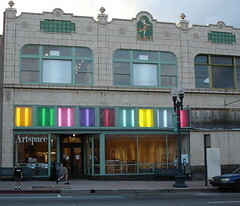 events, but benefited from ArtSpace’s air conditioning – something that one usually has to forego to see a Minicine? program. The films were mostly short, beautiful, and eerie. Several were created without the use of a camera, including What the Water Said, Nos. 1-3, which was created as a result of the film being chewed and crawled upon by creatures on the ocean floor. 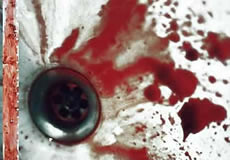 The resulting film is like seeing 24 Jackson Pollock canvases per second. The audio track of the film strip has been affected by the submersion process as well, and in a beautiful meeting of medium and message, the film roars and crashes like the ocean at high tide. This film summarizes what I liked most about every film screened Saturday night: experimental techniques complemented the story of each film, instead of stealing the spotlight and becoming the film’s focus. The frantic, impressionist pinhole photography of My Life As A Bee gives the viewer a first-person account of a bee’s travels from flower to flower. Metaphysical Education uses found footage from educational films to address the formation of male identity, borrowing a technique pioneered by Michael Wallin’s Decodings. Meridian Days applies unorthodox editing techniques and time-lapse photography to toy with the viewer’s perception of time and place, just as the narrator has lost the ability to comprehend where he and his mother are, both literally and in the grander scheme. The TIE event was extremely well-programmed and comfortable, making it the perfect opportunity to sample the Minicine? experience. If you missed out, there’s another great event on the horizon: David Nelson has scheduled a performance by prolific live soundtracking artists Devil Music Ensemble. They’ll be visiting Shreveport on October 5th to perform a live soundtrack to F.W. Murnau’s Nosferatu. Chris Jay, of the Robinson Film Center, penned this review for SptBlog out of his passion for film and his accessible, fast-paced altruism. Hope you will consider writing for SptBlog in your area of passionate point of view. Experimental films will etch the screen at Artspace Saturday night, says David Nelson. This Minicine program "consists of a grouping of hand-made and personal esoteric film experiments from a selection of contemporary film artists from around the world, including, USA, Germany, India and Canada... Representing a range of alternative filmmaking processes including, cameraless, photogram, pin-hole, direct attack, ocean-tossed and more... All these works are on film." More at The International Experimental Cinema Exposition. 8 pm; $5 per. Artspace: 673-6535. TIE Founder/Curator Christopher May (Denver, CO) will be present to screen and discuss this program, adds Nelson. Stranded in Time – A Bootleg Birthday Bash is Friday, September 16 from 7 until 11, at the baroque downtown fun center called the Strand Theater. Tickets are $100, says Penne Mobley; the theme is the “roaring 20s.” Music will come from the Harmon Drew Super Group. 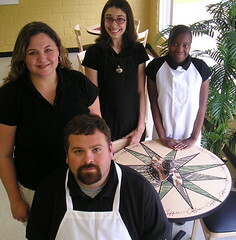 Superior Steakhouse and Ernest’s New Orleans Restaurant and Bon Appetit wil make sure there is a roaring supper. Auction items will include signed posters of past shows and architectural renderings of the Strand, pre-construction. Subterranean tours are $25 extra and worth it, says Danny Fogger - you shall see the sanctuary called the Gentleman’s smoking room. Booze will be served from bathtubs. The Strand's Andrea promises, additionally, "a lot of unannounced, fun, crazy stuff." See more at the Strand's web site. If you're like us you love to evaluate the deliciousness of meals. We are quick to judge and measure and discuss our restaurant fare. 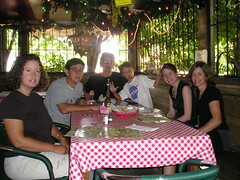 After all, for years I was in and out of New Orleans, a city where people love food and are quick to analyze it. Also, I was a waiter in Shreveport - Fertitta's L'Italy, Fertitta's Central Station and Sleepy's. Additionally, I once wrote the restaurant review column for the Shreveport Journal. Thus I'm happy to see a new local site devoted to restaurant evaluation: Shreveportreviewer.com. It was founded by a fellow who has asked me not to use his name: "The reason I'd like to remain anonymous to the rest of the world is so no one knows when they're being reviewed. I actually haven't started leaving a note for my servers yet, but I do plan to start soon. I will only do it when I'm not paying with plastic, though, so no one can put a face with a name." I think the site has terrific utility and will be helpful to the dining scene. There's a forum for negative reviews and one for the positive. So far I happen to agree with most of the reviews posted, such as IHOP and On the Border, annh, and Monjuni's and Carrabba's, yay. Will Maranto writes from atop a nearby peak, "The Gypsy Mountain Brotherhood will be performing on the Red River District Stage Friday Night, Aug. 12, from, I believe, 8:30-12:30. We've got a new PA that I'm dying to try out. The sound should be nice and warm. We would love to see any and all." Their new CD got a positive review at SptBlog. 21, says Tip's guitar slinger Dan Garner. Winners will receive a free recording session at Odyssey Sound Lab produced by James Burton, a free year-long membership at Tipitina's Music Office Co-Op, and other pow prizes. The competition is open to all guitarists, acoustic or electric, in any style, says Garner. Auditions will be held Saturday and Sunday, August 13th and 14th, from noon to 6 PM, at Tipitina's Music Office Co-Op, 700 Texas Street in Shreveport, right next to Artspace, says Tip's other guitarist, Todd Souvignier. Players selected from the auditions will compete onstage at the Expo Hall during the James Burton International Guitar Festival. 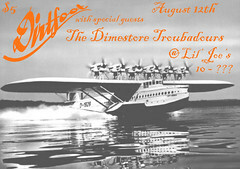 Time travel sideways with the cinematic Dirtfoot at Lil Joes Friday, Aug 12, about 10 pm. Opening is a gravelly-voiced coffee house duo from New Orleans called Dimestore Troubadours. Dirtfoot has a new percussionist, says lead singer Matt Hazelton. The new beard in the lineup calls himself the Dirtfoot "pots and pansist." He is Aaron Butler, Centenary music school drummer and student of all the percussive and musical arts. Butler is the new drummer for experimentalist noise rockers Red Shift. Butler is also a Photoshopper and capable graphic designer. This piece is illustrated with his Dirtfoot flyer. At the Second Annual Physical Manifestation of artists who are part of Northwest Louisiana Art Gallery.com, this was a much-discussed piece: Leland Strebeck's Screaming Strange Somethings. There are nine small paintings hanging on their own furry background. At $200, it is a wholesale price and a terrific gift for a 20-something. Strebeck is capable, productive and growing in vision. He's quite a collectable artist, notes Michael Harold. See some 30 paintings and multi-media pieces in the beautifully-lighted upstairs room at Artspace, recently converted to gallery space. Already sold are pieces by Rachel Stuart-Haas, Noma Fowler-Sandlin and Sandi K. Connolls, says Artspace. Scott Green, executive director of the Shreveport Symphony Orchestra, says ticket sellers will ring you soon to invite you to purchase season tickets for the SSO 2005-06 season. The SSO recently announced that the year-long, international search for a music director has brought young maestro Michael Butterman to the orchestra. Please see Jennifer Flowers' story on the globe-trotting Butterman and the SSO. Learn more about the orchestra at shreveportsymphony.com. Matt Crowson writes that "Friday night's house party and Shreveport introduction to Brian Martin's music went so damn well that he is playing Mon, Aug 8, at Lil Joes. The show will go from 8 pm - 11 pm with a $3.00 cover charge." "Brian will be doing his one man show of Delta Blues. I have yet to hear a discouraging word about his performance this past Friday night at the house party so I can promise you, without a shadow of a doubt - if you know good music - you will love Brian's performance." 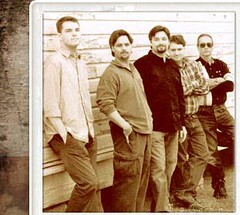 See and hear this high-resolution Americana at brianmartinmusic.com. Sadly, his Lil Joe's show is for ages 21 and up. The Big Positive, a preternaturally-gifted singing, rockin' trio, admits that "ELO, Ben Folds, and Modest Mouse had a baby and named it The Big Positive." 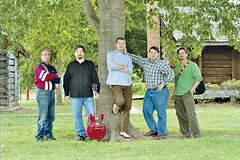 Their bio, found with their gorgeous music on the band's site, myspace.com/thebigpositive, states bluntly , "john, michael, jordan. three guys born and raised in the city of shreveport lousiana, a sad shadow of its southern brothers, empty, barren." With bravado they continue, "john writes the songs mainly under the influence of drugs and unconciousness, submits them to bass player jordan and white drummer michael. an original set-list of 11." They record their vocals and guitars in their Beatlesque arrangements at Michael Stephens' house, says bassist Jordan West, on a PC. They use Cubase software. 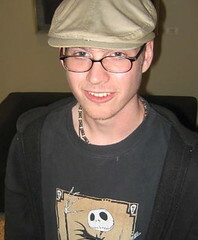 John Martin, the songwriter, gets credit for "vocals, keys, voice synths and Trick Spin Champ," on their myspace site. Stephens is the drummer. All sing. "We just have the music gene, I guess," said West when asked how they developed their harmonies. "It just comes to us." Dan Garner, Tipitina's S'port guru and co-host, with singer-dancer Heather Romero, of Songwriters' Open Mic Night, says "One night these 3 guys were in the back of the room at Songwriter's night and finally asked to perform. They looked entirely disreputable. When they asked if they could borrow my guitar, I had to think about it. But they were great." West says they are not long for Shreveport. He's headed to LSU soon and when John Martin clears out of BPCC they will probably relocate to a place with a bigger audience for original music. For the moment, however, they may be found at Songwriter's Open Mic at Holiday Inn Downtown on Mondays and at 516 Soundstage on Thursdays. More info from Garner at Tip's: 934-0000. Guitar slingers in the Bayou State have been buzzing all summer about a monster jam in Shreveport, one to be hosted by rock legend James Burton (Elvis' TCB Band, EmmyLou Harris, Dylan, Shindig, Ozzie and Harriet Show, etc.). To be held in Shreveport's Municipal Auditorium, once home of the Louisiana Hayride, the show will be held Sat., Aug 20. Guests include icons such as Brad Paisley, Sonny Landreth, Eric Johnson, Johnny Rivers, Steve Wariner, Johnny Hiland, the Nelson Brothers, Jeff Cook from Alabama, Jeff Baxter, Seymour Duncan, Steve Luthaker from Toto, Johnny A. Doyle Dykes, Greg Koch, Roscoe Beck, Dr. John, Steve Cropper, Dickie Betts of Allman Brothers and movie star Steven Seagal. 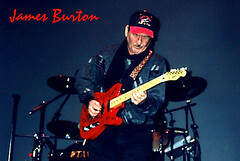 Have you ever heard Burton play live? You have undoubtedly heard him on record, since he is one of the world's record session lions. Jamming at the Revel one year he gave us a brief but breathtaking solo. And when Dylan played the Municipal Auditorium a few years ago Burton joined Dylan for a song or two, and to pleasant effect. Lately he's been slipping into Lil Joes in the wee hours, I've been told, soaking up attitude from the alternative acts criss-crossing the country. Evidently he has little patience with the music of his past and craves the energy he hears in the untamed young players. Outlaw Nation is one of the hardest working bands in the region. If it isn't Christian Simeon, guitarist-singer, making a solo appearance, then it's the whole trio playing venues from A to Z. Outlaw Nation music has some novelty value in that they do alt country tunes even though their deep background is jazz, funk and reggae. But basically they're entertainers and they will perform " rock, funk, reggae, dancehall and everything in between." They're working on a new video. Their CD, Tripping Wire, has been favorably reviewed by New Orleans Offbeat monthly. 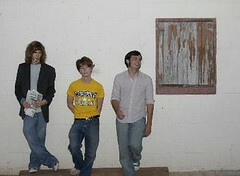 See them Friday at Mia's, the former Mama Mia's, 2109 Market St. More info: 221-1958. "There will be a one-week extension of the deadline for ofrendas proposals," said Shreveport Regional Arts Council bota Pam Atchison after hearing from several artists and Dia De Los Muertos planning committee members. "Also, submissions of Samples of Work can be made by disk, by digital images, not solely by slides," Atchison continued. "It was a misprint to say that samples of Work could Only be submitted by slides." That being said, creative types might bite into the SRAC Call to Artists for Dia De Los Muertos with a fresh lime between their teeth. The new deadline would thus be Friday, Aug 12. Please see the earlier Dia post. 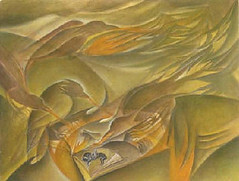 Francis Drew is a marvelous woman of art and mysticism. She paints like a devil while testifying to Jesus. Some years ago I took a visiting French exchange student to see Drew at her painting-filled house. Not only did Drew give a vivid interview, she gave the French girl a small and lovely oil painting as a gift. Drew, who is also a singer-composer, is looking for recording equipment. If you've got some dust-collecting gear to give away, leave a message for her at Artspace, 675-6535. 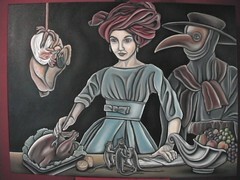 See Drew's latest work online at NorthwestLaArtGallery.com. Michael G Moore has risen to prominence in the arts scene partly by his powerful website, NWLaArtGallery.com, and by his curatorships at Prima Tazza, Turner Art Center, LSUS Gallery, Magale Library Gallery, etc. Nonetheless Michael remains a painter-sculptor of passion, style and considerable output. 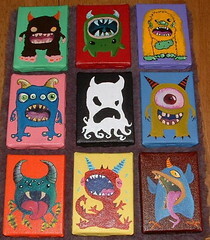 Here is one of his new pieces, Viciosos. It goes on display Artspace/Coolspace tonight, Thur, Aug 4, at a reception for the almost 40 artists who are part of NwLaArtGallery's Second Annual Physical Manifestation show. The melee, 7 to 9 pm, is open to all. Info: 673-6535. 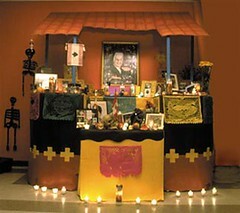 Artists who want to make ofrendas for the exhibition grande at Artspace, Dia De Los Muertos, should see the SRAC call to artists at Shrevearts.org. 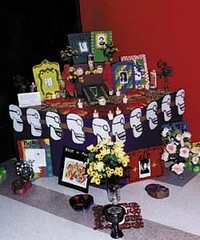 Las ofrendas are not a familiar form to gringo artists. 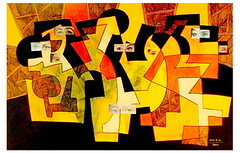 A Yahoo or Google image search is a good way for artists to find out what they are and how they would make one. "These ofrendas need not be copies of the Mexican form," says SRAC honcho Pam Atchison. "We want artists to construct an installation that is interpretive." The SRAC material has a list of Dia websites ready to be clicked. These sites will quickly hip you to the art, philosophy and practice of the Day of the Dead. Artists, artisans and those who love Mexican culture should take the time to read the Call to Artists. There are subsidies for artwork, numerous projects besides the ofrendas and classes to be considered. JB23, aka poet-singer-musician Robbie Cluck, will perform experimental, electronic music at artspace on Friday, August 5, from 9 p.m. until 11 p.m.
JB23 has been called “meditative”, “surreal,” and “haunting." Among the culinary stars being featured at the Gentlemen's Cooking Classic benefit - Southern Univ at S'pt Foundation - at Expo Hall Saturday night is the seafood chef for the Cambridge Club, Jeremy Gilbert. The Times' Tim Greening wrote about Gilbert in its story on the Iron Chef competition, a feature added to the Classic this year by foundation director Felecia Williams-Scott and husband Jerry Scott. Few know about the other side of Gilbert's life; he is a painter of growing skill and accomplishment. Gilbert told me, "As far back as I can remember, I've always drawn. It started like with most children. Simple line drawings and such. Slowly I began incorporating elements of perspective, proportion, and shading, but I've always been afraid of color. The use of color was always something I considered to be out of my reach, since I marveled at the Renaissance painters and their brilliant understanding of it. It wasn't until the Fall of 2003, when I returned from a year and a half break from school, that I began painting in a class. It wasn't so much of what I learned in the class but simply the opportunity and responsibility to paint for assignments. My first piece was an absolute disaster. 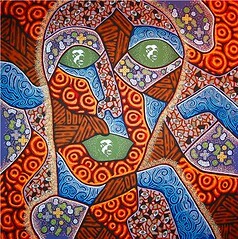 The second piece however, after hours upon layers of paint, I began seeing on canvas what I saw in my head. After that, the act of painting has become more mechanical, but the planning has become more complex." "With my background and love of the culinary arts, I began painting subject matter that was related to my occupation as a chef. 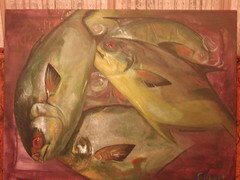 The theme of fish became reoccuring, as I had fresh subject matter delivered weekly to be butchered." "Since I began painting however, I've lost the infatuation with the realists and have fallen in love with artists such as Gustav Klimt and Edward Hopper. I hope to become less objective in my future experience with art in general." Fresh paintings from award-winning painter Dennis O Bryant are being hung at Columbia Cafe, says Matthew Linn. There will be a party in honor of O Bryant's show Sunday, Aug 7, from 5 to 7 pm. Originally a Shreveporter, O Bryant lives in not-too-distant exile: Marshall, TX. 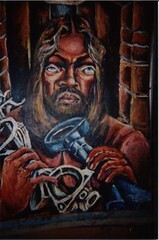 One of his paintings and a sculpture were recently juried into a Longview Museum of Fine Art exhibit. He calls the show cada otra, and explains "cada otra in espanol is 'each another.' But it could be translated 'every other (one).'" 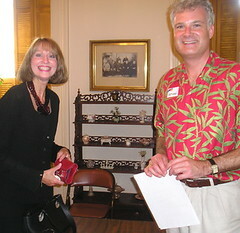 See more on O Bryant in recent posts at Spt Blogspot. Party with the friends and enemies of 34 top regional artists at Artspace Thursday night, Aug 4, from 7 to 9 pm. The occasion is the Northwest Louisiana Art Gallery’s Second Annual Physical Manifestation. Michael G. Moore, the brain and heart behind NorthwestLouisianaArtGallery.com, has curated the show, which features works by 34 visual artists, plus performance, literary and multimedia artists. Music by DJ Jalapeno will put some chili & ciliantro on the event, says Mimsy Borogroves. Ms. B also writes "coolspace, the versatile, moving area of artspace created for the use of regional artists, will this time present on the second floor of the multi-use art center, as the building makes its transition from The Art of Robots Exhibit to one based on the Dia de los Muertos celebrations of Mexico." How many of these perpetrators do you know? Here's the lineup: Vivian Ogea Allen, Joanna Ballard, Mark Charleville, Liz Christler-Stacy, Carlos Colon, Sandi K. Connolls, Johnna Crider, John Dellenger, Denise Peske Dews, Dorthinia, Minister Frances Louise Drew, Stanton Dossett III, Alan Dyson, Debbie Buchanan Engle, Noma Fowler-Sandlin, Cookie Garner, Dan Garner, Bill Gingles, Micah Harold, Michael Harold, Randy Hedgecock, Martha Kostiouk Hollier, Ray Holt, Mary Sorrows Hughes, Neil Johnson, Dawn Marie Landrum, Loridana, Robert Moe, Michael G. Moore, Lenora Nazworth, David Nelson, Jody Raney, Tony Reans, Pearl Serbanic, Lisa Smith, Leland Strebeck, Rachel Stuart-Haas, Joanna Tagert, Henry Turner, Jr. and Flavor, Jen Wasson, Danny J. Williams, and Jerry Wray. More info: visit NorthwestLouisianaArtGallery.com. For more information about coolspace, artspace, or the upcoming exhibitions, please call artspace at 673-6535 or the Shreveport Regional Arts Council at 673-6500. artspace and coolspace are projects of the Shreveport Regional Arts Council, says SRAC officer Freda Powell.